The North American video entertainment distribution industry is a perfect example of where disruption was desperately needed to unseat the incumbent providers who had become complacent. First, it was the video rental stores, then the legacy pay-TV service providers. The only question that most savvy consumers asked was "why did it take so long for someone to offer a substitute to pay-TV?" The introduction of over-the-top (OTT) video offerings, such as Netflix, was a much-needed alternative to the high-cost traditional pay-TV service that's most known for its programming re-runs and perpetual interruptions from advertising. 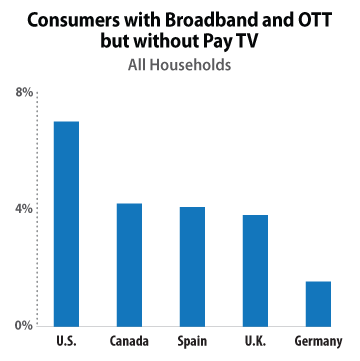 The consumer rebellion to abandon pay-TV is becoming a worldwide, but slow moving, phenomena. Parks Associates latest market study found that global OTT video service subscription revenues will increase from nearly $9 billion in 2014 to over $19 billion in 2019. Currently, 57 percent of U.S. broadband households subscribe to an OTT video service. Among European broadband households, 57 percent in the UK, 29 percent in Spain, and 24 percent in Germany subscribe to an OTT service. Parks also finds that in 2015, approximately 7 percent of all U.S. households, or 8.4 million households, subscribe to broadband and at least one OTT video service but do not subscribe to pay-TV. This figure includes consumers who have discontinued pay-TV service and those who have never subscribed to pay-TV. In other Western nations, this same figure is approximately 4 percent or less among all households. Traditional service providers are introducing their own OTT services to appeal to consumers who are not currently taking pay-TV. That said, it's unclear if they can overcome the negative perception of their brand and typically poor reputation for customer-service in the local marketplace. "The OTT video services marketplace continues its rapid rate of change, impacting the video ecosystem across world markets," said Brett Sappington, director of research at Parks Associates. Parks believes that while incumbent service provider attempts at "TV Everywhere" launches have made little if an impact on reversing the pay-TV decline, OTT video services are experiencing a relative boom. A variety of pay-TV incumbents are entering the market, and operators including DISH Networks, Rogers Communication, Bell Canada, and Sky are responding to the disruption threat with OTT video services of their own. How the industry responds to this change will ultimately affect the fundamental structure of the video industry for years to come. Clearly, many of the apathetic majority of video consumers may continue to subscribe to legacy pay-TV services -- if they can afford the high-cost. However, more companies in the evolving video ecosystem are eager to reach those discerning consumers who are adamant that they will never subscribe to the services of a traditional pay-TV provider.